The poetry and meditations of Pope John Paul II appear below on this page, along with biographical information that reveals his development as an actor and as a writer. The Bible published by the Roman Catholic Church, the NABRE (New American Bible Revised Edition), doesn't contain a single mention of the word "hell." If this interests you, please click here to learn Why hell is vanishing from the Bible. This is also true for the HCSB (Holman Christian Standard Bible) published by the famously literal and conservative Southern Baptist Convention. If the subject of biblical inerrancy interests you, please read Is the Bible infallible, or the inerrant word of God? Karol Jozef Wojtyla was an unknown Polish poet long before he became known to the world as Pope John Paul II. Some of the poems below were written when he was in his twenties. Others were written while he was a parish priest and auxiliary bishop of Kraków, during which time his work appeared in Polish journals under the pseudonym Andrzej Jawien. His poetry was later collected and published in The Place Within — The Poetry of Pope John Paul II, with translations and notes by Jerzy Peterkiewicz. now stands face to face before Him Who Is! —From "Meditations on the Book of Genesis: At the Threshold of the Sistine Chapel"
Wojtyla was born in Wadowice, in an apartment that looked out on the Church of Our Lady where he would later serve as an altar boy. His birthday was May 18, 1920, an auspicious day for modern Poles, now known as "the Polish Miracle." On that day, Marshal Jozef Pilsudski won a major battle and seized Kiev from the Soviet Union. It was Poland's first major military victory in over two centuries. Wojtyla's middle name was chosen by his father in honor of Jozef Pilsudski. Tu es Petrus (Mt 16:18) — once heard by Simon, son of John. "To you I will give the keys of the Kingdom." Known to family and friends as Lolek (a nickname that translates as "Chuck"), the future John Paul II learned about suffering at an early age when his mother died of heart and kidney problems in 1929, shortly before his ninth birthday. —"Over This, Your White Grave"
The poem above and the one below, both written by the time he was twenty, show the heart of a motherless young boy through the pen of talented poet. When he was twelve, Wojtyla's brother Edmund, a 26-year-old physician in the town of Bielsko, died of scarlet fever. Wojtyla himself had two brushes with death as a youth. He was hit once by a streetcar and again by a truck. "The pope's youth wasn't happy," Father Joseph Vandrisse, a former French missionary and now a journalist, told TIME Magazine. "He has meditated a lot on the meaning of suffering..."
Like Ronald Reagan, Wojtyla was an actor. And a dark-haired, ruggedly handsome actor at that, as his picture to the left attests. In the early 1930's, he met Mieczyslaw Kotlarczyk, who would teach him (and isn't it an interesting "method" for a future Pope!) "the Living Word," a style of performance rooted in Polish songs and Polish poetry as sung and recited after dinner in country manor houses. In Pope John Paul II: The Life of Karol Wojtyla, Fr. Mieczyslaw Malinski recounts that it was during this time that Wojtyla first came to the attention of the Archbishop of Kraków, Adamo Stefano Sapieha. Sapieha was visiting his school and young Wojtyla gave the welcoming speech. Impressed, Sapieha asked whether Karol intended to become a priest. A priest replied that his interests seemed to lie with the theater, "an answer which disappointed the archbishop!" To make matters perhaps worse, Wojtyla later joined an experimental theater group known as "Studio 38." His love of the theater persisted, because later as a cardinal, he celebrated holidays with Krakow actors. from my self, as it were. the man that I am? look at himself without fear? you think you are the center of things. The human heart—what is it for? Wojtyla continued his studies until the Nazis closed the university. The Nazis also closed libraries and only Germans were allowed to attend plays and concerts. A Pole could be shot for going to the theater. In November of 1940 Wojtyla took a job as a stone-cutter at a quarry near Kraków. and over his head, joined in a sharp arc, shoulders and veins vaulted. Around this time, he met a tailor, Jan Tyranowski, who introduced him to St. Teresa of Avila and St. John of the Cross, "setting him on a deeper spiritual path." 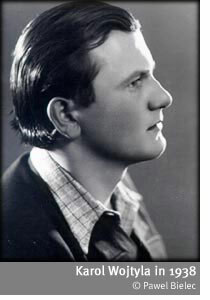 And yet his passion for the theater remained undimmed: when Kotlarczyk came to Krakow in the summer of 1941, Wojtyla and his friends helped him start the underground Rhapsodic Theater, at the risk of their lives. Wojtyla wrote to his teacher and mentor that he wanted to build "a theater that will be a church where the national spirit will burn." The Rhapsodic Theater "embraced the theatrical minimalism of long, static monologues and epic poems." Wojtyla was also a budding playwright. At the age of 19 he had penned a blank verse biblical trilogy of David, Job and Jeremiah. By the age of 21 he was translating Greek tragedies and compiling patriotic Polish poetry. In addition to his more avant-garde work, Wojtyla also wrote a traditional play called "Our God's Brother." It is reported that once when Wojtyla was clandestinely reciting an hour-long epic poem, Nazi megaphones began blaring forth news of a German victory, and he simply shouted out the remainder of the poem over the megaphones. To illustrate the inherent dangers of daring to perform under the pince-nezed noses of the Nazis: members of the Rhapsodic Theater were later deported to Auschwitz. Wojtyla "had never been an actor so much as an intoner" and the Rhapsodic Theater shed "all the clutter that gets between actors and their lines. Plot, action, even emotion, amounted to little more than pleasant diversions; the substance was all in what was spoken." Wojtyla also joined Jan Tyranowski’s clandestine underground religious circle, The Living Rosary. In February of 1941, Wojtyla's father, a devout Catholic, died at the age of 61. The pope has said that his father once told him, "I will not live long and would like to be certain before I die that you will commit yourself to God's service." Friends said that when his father died, Karol knelt for 12 hours in prayer at his father's bedside. Soon thereafter, he withdrew from the theater to study for the priesthood, a decision that surprised many of his friends, who tried to convince him that his talent lay in the theater! He later said, as pope, "At 20 I had already lost all the people I loved." Wojtyla was arrested in 1942, but was released because of his job at the quarry, perhaps escaping death because of the value of his muscle, even as others deemed "less valuable" died around him. Should he be used by those who came after, deprived of substance, unique and deeply his own? But the man has taken with him the world's inner structure, where the greater the anger, the higher the explosion of love. Jagiellonian University reopened in 1942 and Wojtyla entered the faculty of theology with the intention of becoming a priest. In 1944, he attended an underground seminary at the residence of Archbishop Sapieha, who was soon to become Cardinal Sapieha. Around this time, Wojtyla was hit by a car while saving a man's life. After the "liberation" of Kraków by Soviet forces, Wojtyla completed his studies and in 1946 was ordained as a priest by Cardinal Sapieha, in Sapieha's private chapel. In his book, "A Gift and Mystery," published 50 years later when he was Pope John Paul II, he said that he still feels a debt to friends who suffered "on the great altar of history" during World War II, while he studied in Sapieha's clandestine seminary. Wojtyla began doctoral studies in philosophy in 1947 and earned his doctorate in 1948 (he wrote his dissertation on The Problem of Faith in the Works of St. John of the Cross). He went on to earn a doctorate in moral theology from Jagiellonian University. In 1954 Wojtyla accepted a non-tenured professorship at the University of Lublin (the only Catholic university in the communist world) and would teach in various capacities for the next 20 years. Catholic News Service reports that "As a young priest, he was a favorite with students at Lublin University who flocked to his classes and joined him on camping, hiking and canoeing trips." He also founded a service that dealt with marital problems, including family planning, alcoholism and physical abuse. TIME Magazine once called it "perhaps the most successful marriage institute in Christianity." He published more than 100 articles and several books, and in 1956 became a full professor at the Institute of Ethics in Lublin. According to Catholic News Service, "Father Wojtyla's interest in outdoor activities remained strong, and younger companions called him 'the eternal teen-ager.' Groups of students regularly joined him for hiking, skiing, bicycling, camping and kayaking, accompanied by prayer, outdoor Masses and theological discussions." His first book, Love and Responsibility, was published in 1958. It advocated equality between married men and women and taught that sexuality between married couples was good: close to if not radical ideas for the church at the time. It was a bestseller. Characteristically for the athletic, outdoors-loving Wojtyla, he was on a kayaking trip in 1958 when, at age 38, he was made auxiliary bishop of Kraków, the youngest bishop in Poland's history. In 1960 Wojtyla returned fleetingly to playwriting with the "dense and almost counterdramatic" play "The Jeweler's Shop." The play was performed several times on Polish radio, then resurfaced in the 1980s as a movie starring Burt Lancaster. Wojtyla, by then Pope John Paul II, received a screenwriting credit. According to a reviewer, the play "grapples ... with two of his chief concerns as Pontiff—how to articulate true goodness and how to foster love. It is, it was, as the chorus councils in the first act: 'words and hearts, words and hearts.'" In 1963 he was promoted to archbishop and in 1967 he became Cardinal Wojtyla, at a time when the Polish Catholic church was being severely oppressed by Poland's communist government. His appointment as cardinal by Pope Paul VI was welcomed by the government, but only because he was woefully underestimated. a strait riverbed can't imprison them long. The Polish secret police, the UB, had not been worried at Wojtyla's promotion to archbishop, considering him a poet and apolitical dreamer. In 1967, the UB (the Polish secret police) analyzed Wojtyla as follows: "It can be said that Wojtyla is one of the few intellectuals in the Polish Episcopate. He deftly reconciles ... traditional popular religiosity with intellectual Catholicism ... he has not, so far, engaged in open anti-state activity. It seems that politics are his weaker suit; he is over-intellectualized ... He lacks organizing and leadership qualities, and this is his weakness ..."
General Wojciech Jaruzelski, former secretary of the Polish Communist Party, later admitted just how badly Wojtyla had been underestimated: "My Communist colleagues decided that the Bishops ahead of Karol Wojtyla on the list of candidates were not good for the state, so they pushed Karol Wojtyla. The Holy Spirit works in mysterious ways." Current Biography called Wojtyla "a resilient enemy of Communism and champion of human rights, a powerful preacher and sophisticated intellectual able to defeat Marxists in their own line of dialogue." According to George Weigel, Wojtyla demanded permits to build churches, defended youth groups and ordained priests to work underground in Czechoslovakia. Wojtyla was once asked if he feared retribution from government officials. "I'm not afraid of them," he replied. "They are afraid of me." In 1969 Wojtyla published The Acting Person, considered his principal academic work. 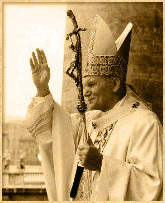 In 1978 Wojtyla became Pope John Paul II. He is said to have wept that day, October 16th, and to have put his head in his hands. Becoming Pope is "a clear cut off from one's previous life, with no possible return," one biographer wrote. In 1979 John Paul II made his first trip to Poland as pope. Within a year, Polish tradesmen formed the now-famous Solidarity labor union, headed by Lech Walesa. The pope received Walesa at the Vatican in 1981. Yet can the current unbind their full strength? In 1982 the pope and Ronald Reagan first met, in the Vatican. According to Time Magazine they agreed "to undertake a clandestine campaign to hasten the dissolution of the communist empire. ... The operation was focused on Poland ... Both the pope and the president were convinced that Poland could be broken out of the Soviet orbit if the Vatican and the United States committed their resources to destabilizing the Polish government and keeping the outlawed Solidarity movement alive after the declaration of martial law in 1981." According to UPI: "Thus began a series of unofficial, intermittent contacts that some writers and historians have elevated to the status of holy alliance, while others have denied almost their very existence." In 1983 the pope returned to Poland for a second visit. Walesa, who later became the president of Poland, said John Paul II deserves "the greater credit" for the end of communism in Poland: "At the moment when the pope was elected, I think I had, at the most, 20 people that were around me and supported me — and there were 40 million Polish people in the country. However ... a year after (the pope's) visit to Poland, I had 10 million supporters and suddenly we had so many people willing to join the movement. ... I compare this to the miracle of the multiplication of bread in the desert." Pope John Paul II died on April 2, 2005. Note: the primary sources from which this biography was largely excerpted were "Tu Espetrus" and "John Paul II: His Life and Papacy" by Jane Barnes and Helen Whitney. Other sources included "The priesthood years: rebel with a cause" and "Pope and Reagan: allies against communism." to test the strength of each blow. cuts through a river of rock. and which is never spoken, but just breaks high vocal cords. someone whispers: "Yet here is a great force." through the even knocking of hammers. the stones know this violence. cut by a vertical thought born in the eyes. sentenced to grandeur and error. He was a Pillar of the Faith, a Tower. He lasted longer than any Pope but two. He rent the Iron Curtain, adored the Poor. He adored Youth; Youth adored Him. of "intellectual", "man of letters". conveying innermost Spirit through outward stance. wherever He landed ... His Parish the wide, wide Earth! the last received mere days before He died. was enough ... allowing me to use Him to grow. and always pointing only to what was positive. to inspire and to bless me and encourage me! to build bridges between Heaven and Earth.